Summer means pickling, sun dried fryums and obviously mangoes. 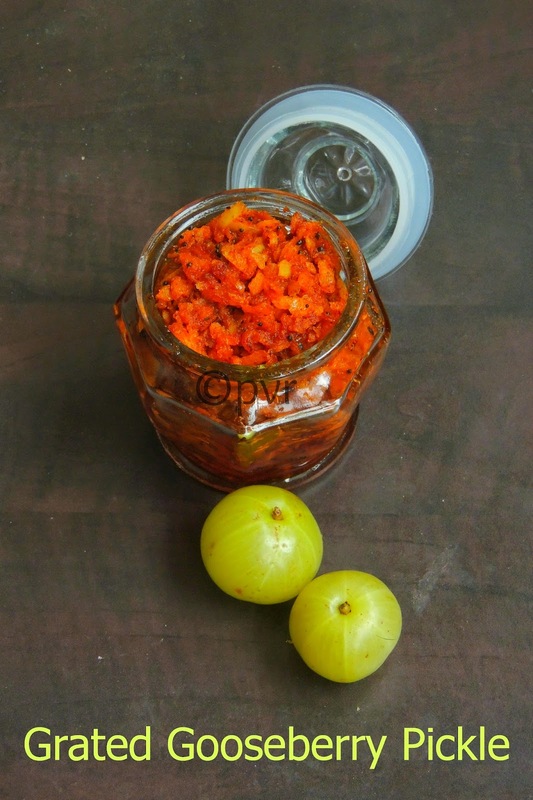 After posting a simple, very delicious sweet and tangy chaat with mangoes, today am posting an another interesting pickle with gooseberries. This wonderful gooseberries are excellent source of Vitamin C and the precious oil which is extracted from its seeds and pulp are used as a treatmet for hair and scalp problems is highly prized.Amlas aka Gooseberries are cooling agent and its adviced to take them often in your diet while its peak summer. These Indian gooseberries offers 5 different tastes, yes they are sour, bitter,pungent ,astringent often ends in sweet taste which is enhanced if you drink water after having amlas. Whenever i get a chance to get gooseberries from Indian stores here, i wont hesitate a second to pick them,but this time my mom came back with a bag of super fresh gooseberries from India. 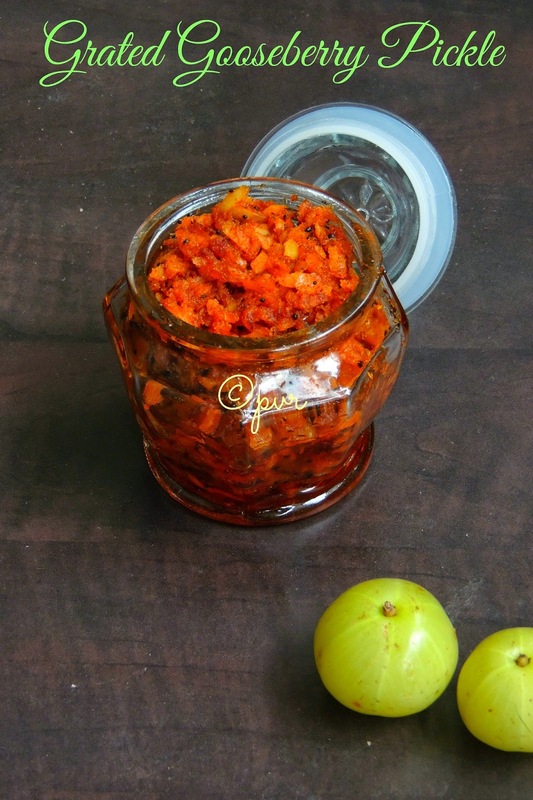 Immediately i prepared this grated and very quick version of this pickle, served with curd rice this grated version of pickle tastes absolutely marvellous and my instant pickle gets almost vanished within a week. This pickle stays very much prefect for a month in room temperature,but i bet this grated version of gooseberry pickle is very much addictive,that they wont stay for a long.Am running my second week of blogging marathon with 'Summer Special' as theme and this pickle goes for this week's blogging marathon.Check out the Blogging Marathon page for the other Blogging Marathoners doing BM#41. Dry roast the fenugreek seeds and asafoetida powder together,once they get cool,grind as fine powder,keep aside. In a pan,heat the oil,add the mustard seeds and let them splutters. Add the grated gooseberries,salt,chilly powder, kashmiri red chilly powder and saute everything for few seconds. Add the fenugreek-asafoetida powder, cook until the oil gets separates from the pickle. Cool completely and store in a bottle. Enjoy with ur favourite food. Sending this post to Ahlan Ramadan-The Healthy Way. I love raw gooseberries. Your pickle brings back so many memories from back home:). That's a very good one..healthy pickle with a vibrant colour. My mom makes gooseberry pickle but do not know how exactly she pickles it. Pickle is mouthwatering, perfect with some curd rice. Drooling here Priya! Love the amla picke! Tangy pickle, never thought of grating amla and preparing pickles, nice idea. Thanks for sharing. Tangy and lipsmackingly delicious looking pickle. i prefer tis one.. not much oil reqd compared to usual ones..
Nice spicy pickle.. You can post it on my pickles page "Pickles R Us" on facebook. Nice recipe dear..would love to try this instant pickle sometime.. This is so tempting pickle ..lovely ! The thought of the taste of gooseberry pickle is making my mouth water. Looks so good Priya.We have an aranellikai tree in the backyard and it is full of these berries. Will try this recipe. Omg u grated that gooseberry,I admire u Priya ! When I think of the gooseberry pickle my mouth is watering. Very nice one Priya...I love these instant pickles and they taste so good as well.. Instant pickles are always a treat for summer. lovely Priya. Tangy, spicy and delicious pickle.. Mouth watering pickle, Priya. Hats off to your patience in grating them. I wish this would work with the frozen gooseberry. How can I make this using frozen alma / gooseberries. NO fresh ones available in US. @It's just meYea u can do with frozen amlas too...hope this helps.